Softness in the energy sector is not dampening passenger growth at Houston Intercontinental Airport as the facility during 2015 is adding a mix of new services to Central America, Asia and Australia. Houston Intercontinental has enjoyed solid expansion into Asia during the last couple of years, which has helped to bolster its international passenger numbers while domestic passenger growth has also charted a steady course. Although Houston Intercontinental is a hub airport dominated by United Airlines, the facility does have some penetration from ULCCs, particularly Spirit, which recently capped off a domestic push from Intercontinental with new international service. 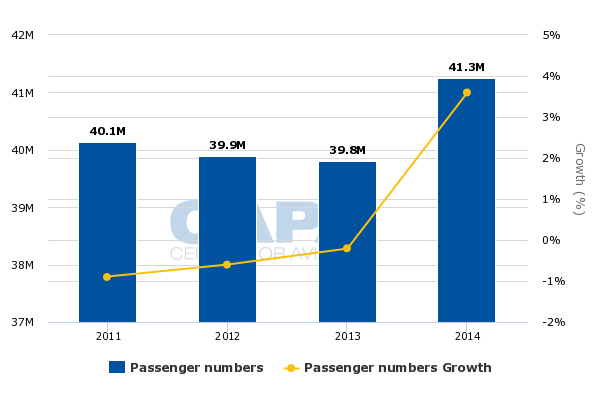 Houston Intercontinental charted 3.6% passenger growth in 2014 to 41.3 million travellers. 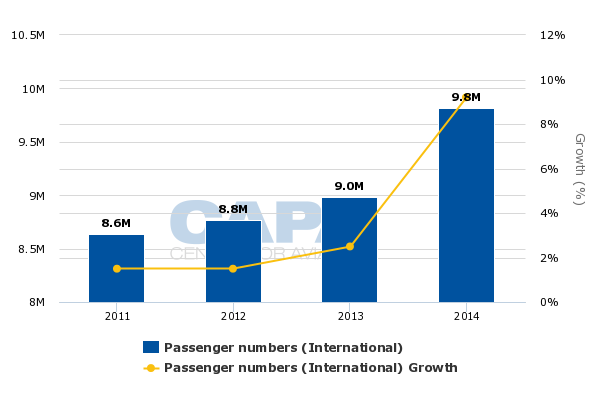 International passengers jumped 9.2% to 9.8 million. 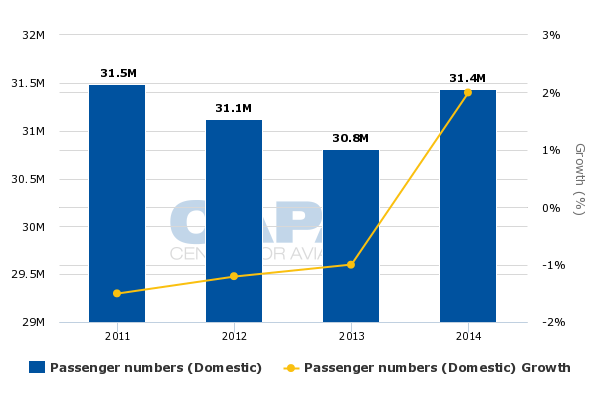 The airport’s domestic passenger throughput grew 2% during 2014 to 31.4 million. Houston Intercontinental also charted solid growth in 1H2015, with a 3.6% rise in total passengers to nearly 21 million. Domestic passenger levels increased 3.5% to 16 million and international passenger growth reached 3.9% to approximately five million. The growth is a positive sign as the regional economy of Houston is significantly dependent on the energy sector. Houston Intercontinental’s largest airline United cited weak corporate demand from the energy business as a driver of falling unit revenues in 2Q2015. United’s overall corporate revenues fell by 5% in 2Q2015 on flat traffic, but revenues from corporate oil and gas clients dropped 30%. However, the company concluded that was the trough in demand from the energy sector, and did not anticipate further material deterioration in 2H2015. Canadian airline WestJet, which has a large presence in the oil-dependent province of Alberta, and has previously cited weakening demand in the oil and gas sector within that region, launched flights from Calgary (located in Alberta) to Houston Intercontinental in early Sep-2015. That would indicate that WestJet has some confidence of the energy sector rebounding. WestJet’s rival Air Canada also operates service from Calgary and Toronto to Houston Intercontinental. However, SAS recently declared its intent to end service from Stavanger to Houston Intercontinental in Oct-2015, citing falling demand in the energy sector. The flight, operated with a Boeing 737-700 in 44-seat business configuration, debuted in Aug-2014. Although Houston is not United’s major Asian gateway, Houston Intercontinental has secured a fair amount of new service to Asia during the last couple of years. United’s fellow Star Alliance member Air China introduced service from Beijing to Houston Intercontinental in 2013 and Korean Air introduced flights between Seoul and Korea in 2014. According to news outlet The Houston Chronicle, several local groups from Houston worked for nearly three years to secure the flights to Seoul. 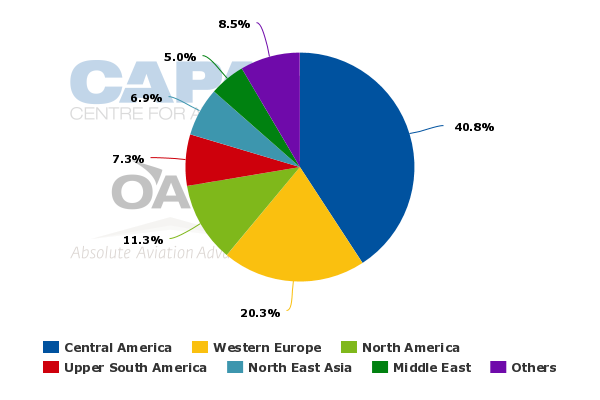 Data from CAPA And OAG show that for the week of 14-Sep-2015, one-way seats on offer between Houston Intercontinental and Northeast Asia have grown 7% year-on-year to nearly 8,000. EVA Air launched flights from Taipei to Houston in Jun-2015. As previously reported by CAPA, EVA plans to increase its offerings on the pairing from three weekly flights to six in 2016, with the target of daily service. EVA is targeting mainly leisure and ethnic traffic on the service to Houston, and has stated that Houston has a large ethnic Asian population. The airline has previously estimated that connections through Taipei would represent more than 50% of total traffic on the pairing. Japan’s All Nippon Airways also launched service to Houston Intercontinental from Tokyo Narita in Jun-2015 as part of its immunised joint venture with Star Alliance partner United, which also operates service on the pairing. Not only can the two airlines coordinate on pricing and scheduling, but onward connections in both directions allow for blanket network coverage, particularly beyond flights from Tokyo and United’s comprehensive network from Houston to Central and Latin America, which includes newly launched service to Santiago. Central America is also a key region that United serves from Houston Intercontinental. 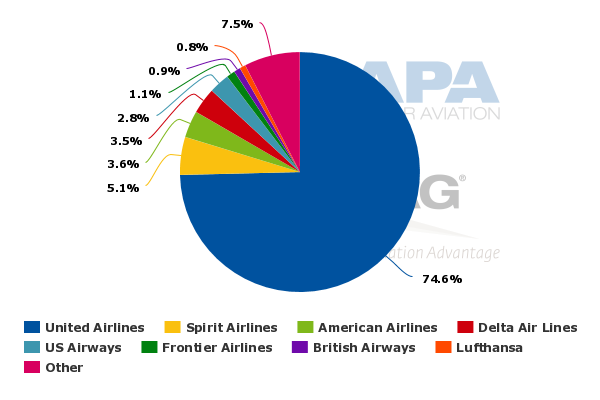 Data from CAPA and OAG show that for the week of 14-Sep-2015 United is the second largest airline operating between the US and Central America with a 17% share of the roughly 326,247 one way seats on offer. American holds a 19% share. Central America is Houston Intercontinental's largest international region measured by seat deployment. Houston has also secured new service from Central American airlines during 2015. Volaris launched from its stronghold in Guadalajara, and its rival Interjet introduced new service between Houston and Mexico City Juarez, joining United and Aeromexico on the pairing. Spirit Airlines also launched flights to nearby Mexico City from Houston Intercontinental in May-2015. Houston Intercontinental is capping off a solid year of international expansion in late 2015 when United’s fellow Star partner Air New Zealand introduces service from Auckland to Houston. Originally, the route was pegged for United’s Boeing 787 widebody, but United opted to cancel plans to launch the service after a row with the city of Houston over the new international terminal under construction at Houston Hobby, where Southwest Airlines plans to launch new international flights in late 2015. The service from Air China, ANA and Air New Zealand is made viable by the connections those airlines can maximise on Star partner United and vice versa. With Houston Intercontinental serving as one of United’s largest hubs, the airport can definitely tout the benefits of blanket connectivity to many Star Alliance airlines as it works to secure new international service in the future. Houston also benefits from the significant connectivity options offered by Emirates and Qatar (a oneworld member) on their respective services to Dubai and Doha. Those flights reflect a mix of international offerings from global alliance members and non aligned airlines, which is obviously important to Intercontinental as it balances being a major airline hub while ensuring attracts service from a variety of airlines. One airline that has opted to make a push from Houston during the last couple of years is ULCC Spirit Airlines, which is Intercontinental’s second largest airline measured by seats deployed. Spirit’s philosophy is that it can stimulate cost conscious traffic in a market like Houston heavily dominated by one airline without stealing traffic from that carrier. After launching several domestic routes during the last couple of years Spirit in 2015 has mostly added international flights from Houston Intercontinental including Toluca, Managua, San Jose, Costa Rica, San Pedro Sula and San Salvador. It has also added seasonal service to Los Cabos. The ability of Houston Intercontinental to secure ULCC service is important as the dominance enjoyed by United allows the airline to command pricing in the market given its concentration at Houston Intercontinental. United has not openly commented about matching ULCC fares, but rival Delta has created a new fare class to target the ULCC passenger base, and American, which competes with Spirit at Dallas/Fort Worth, has said it was matching ULCC fares. If United opts to match Spirit’s fares on select frequencies in the markets where the two airlines compete, average fares in those markets will fall. Spirit’s fellow ULCC Frontier also offers service from Houston Intercontinental to Denver, San Francisco, Philadelphia and Phoenix. It competes with Spirit and United on flights to Denver, and US Airways and Untied on service to Philadelphia and Phoenix, which are hubs for American/US Airways (currently in the process of merging). Spirit serves the San Francisco Bay area from Houston with flights to Oakland. Houston Intercontinental is winding down a busy 2015 marked by a broadening of its international offerings while both international and domestic traffic remain strong. The airport during 2015 has garnered a particularly strong response from foreign airlines launching flights that include a mix of airlines from Latin America, Asia and Australia. With much of the new service launching in mid-2015, Intercontinental’s steady growth trajectory should continue into 2016 as the recently launched flights mature. Its strong traffic growth shows the airport is withstanding any fallout from the disruption in the oil sector.